Baaaaa! Our wooly sheep friends are at the fair all 12 days. Find them in the Sheep Barn! Thursday, Aug. 23: 9 a.m. to 8 p.m.
Friday, Aug. 24: 9 a.m. to 8 p.m.
Saturday, Aug. 25: 8 a.m. to 8 p.m.
Sunday, Aug. 26: 8 a.m. to 5 p.m. Note early closing time due to Livestock Arrival & Departure. Monday, Aug. 27: 9 a.m. to 8 p.m.
Tuesday, Aug. 28: 9 a.m. to 8 p.m.
Wednesday, Aug. 29: 9 a.m. to 8 p.m.
Thursday, Aug. 30: 9 a.m. to 5 p.m. Note early closing time due to Livestock Arrival & Departure. Friday, Aug. 31: 9 a.m. to 8 p.m.
Saturday, Sept. 1: 8 a.m. to 9 p.m.
Sunday, Sept. 2: 8 a.m. to 8 p.m.
Monday, Sept. 3: 8 a.m. to 5 p.m. Note early closing time due to Livestock Departure. To learn about the many benefits sheep provide, pay a visit to the Baa Booth in the Sheep Barn. And we can’t forget about the loveable goats. 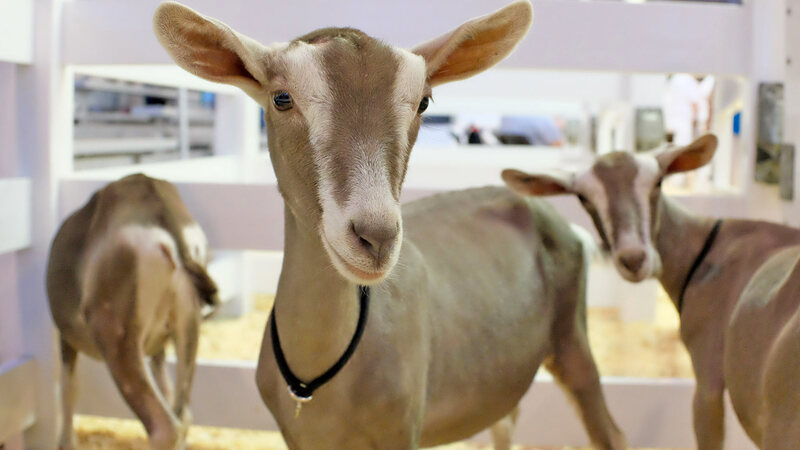 Did you know that the Minnesota State Fair has one of the top-ranking dairy goat shows in the nation? See these goats, as well as boer goats, the first four days of the fair in the Swine Barn. Boer goats can be found in the Swine Barn the middle four days of the fair as well. Dairy goats will be back the last four days of the fair and can be found in the Sheep Barn. Be sure to check out the daily schedules for exact hours of where and when to find the sheep and goats during the fair, including judging.